LuckyDino NZ Casino Review - $400 Bonus + 120 Free Spins! An online casino with a truly imaginative and unique theme, LuckyDicno Casino takes you inside the world of one happy go lucky dinosaur always in a mood to improve your day. The playful and entertaining atmosphere, combined with a great selection of pokies, make LuckyDino an excellent choice for players of all shapes and sizes. This friendly and exciting site will provide you with all the entertainment you can handle. When you open a new account at Luckydino Casino you will receive 20 free spins on Starburst, Spinata Grande, Gonzo’s Quest, Stickers or Tornado. You now have 20 free spins that can be played on Starburst, Spinata Grande, Gonzo’s Quest, Stickers or Tornado. Luckydino offers a welcome package of $400 + 100 free spins that can be claimed upon your two first deposits. Your casino bonus will be credited instantly and your 50 free spins will be credited the following day at 23:00. Free Spins have 0 times wagering requirements. The maximum cashout from the 20 free spins no deposit bonus is $500. Casino bonuses has to be wagered 50 times the bonus amount. LuckyDino Casino was established in 2014, looking to offer a different alternative in a crowded online gambling space. The site is licensed and regulated by the Malta Gambling Authority, which makes it a safe option for New Zealand players looking to try their luck. Players will find a variety of gaming options, primarily slots from different leading developers. There are also electornic table games and video poker machines if that rocks your boat. The only thing missing at the moment is the live dealer section. The casino is available from the web browser with no need to download or install any software locally. The LuckyDino Casino site is offered in several languages other than English, including German, Swedish, Norwegian, and Finnish. 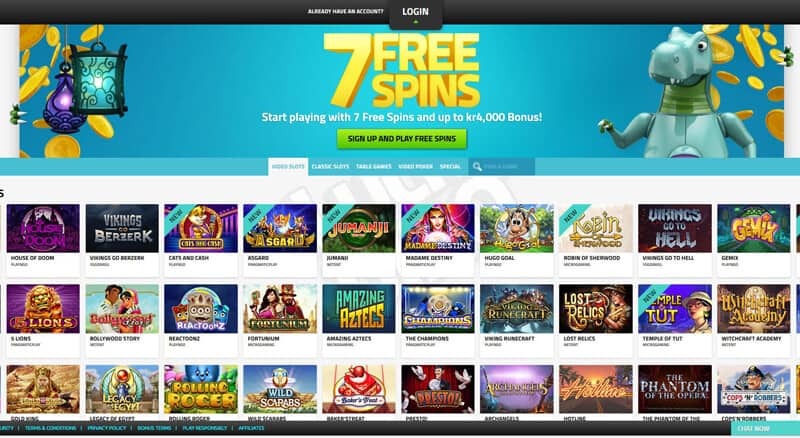 LuckyDino hosts several hundred pokies from a number of quality game providers. Players looking for some excitement will have access to a variety of classic titles, such as Jungle Spirit, Steam Tower, Six Acrobats, and Jack Hammer, as well as numerous fresh releases, as LuckyDino regularly updates its library of games. Apart from slots, the casino also hosts many electronic table games, such as roulette, blackjack, baccarat, Caribbean Stud, Red Dog, Oasis Poker, and Texas Hold’em Pro. These come with a wide array of betting options, so high rollers and casual players will be equally able to enjoy the games. Video poker fans might not find everything they were hoping for, but the casino does host some of the most popular variations like Deuces Wild, All American, Jacks or Better, and Joker Wild. At the moment of writing this review, LuckyDino doesn’t have a live dealer casino. This is certainly an important segment in today’s gambling environment and it can be a deciding factor for many players. So, hopefully, the casino management will look into introducing live dealer tables in the near future to make the offer complete. LuckyDino Casino strives to make its players happy and involved with the experience and these efforts go beyond what happens at slots or tables. Kiwi players will certainly enjoy the fact that every spin at pokies counts at LuckyDino, as it helps you move forward on the VIP progress bar available for you to inspect at all times. 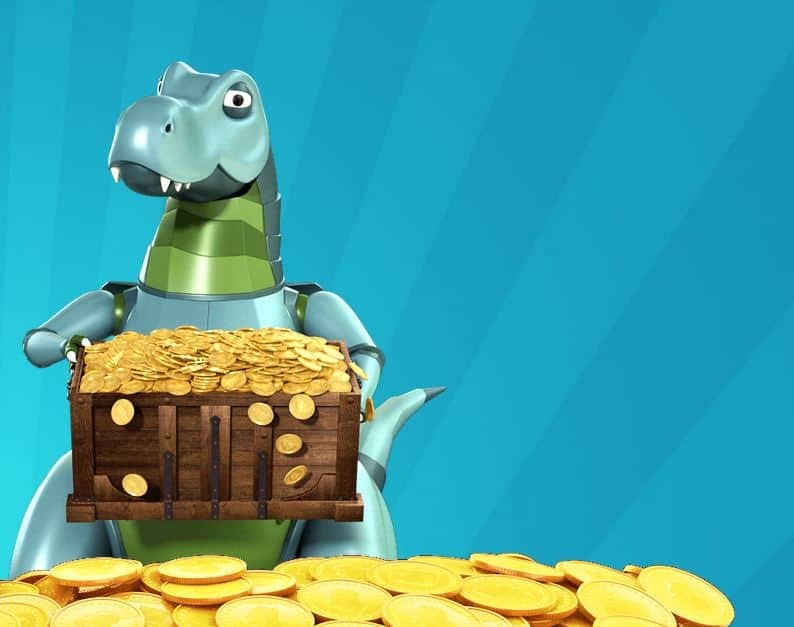 As you play your favorite games and move along, you’ll unlock special LuckyDino rewards, usually issued as free spins –regular, super, or mega spins, offering a higher basic value. The best part about these rewards is the fact everything you win from free spins is completely wager free and yours to keep and do with as you like. Like all modern casino, LuckyDino offers a mobile version offering players access from their handheld devices. There is no need to download or install any standalone application as the site is fully optimized for use with a variety of mobile phones and tablets, regardless of the underlying operating system (Windows, Android, iOS). Players who prefer gambling from their mobile devices will not suffer in terms of the experience as the full range of games is available via the LuckyDino mobile site and all games are designed so to scale to fit smaller screens. LuckyDino Casino offers a long list of deposit and withdrawal methods, some of which will be particularly convenient for New Zealand players. From a range of credit and debit cards, over numerous e-wallets, to different alternative methods, LuckyDino has an option for everyone. The minimum deposit and withdrawal limits are fairly reasonable and there are no fees charged on deposit. When it comes to withdrawals, processing times are quite fast, especially when using e-wallets, with payments usually issued within 24 hours. The first withdrawal of the month is free, but all other withdrawals have a 3% fee attached to them. The casino strives to keep their players happy and resolve any issues they may have quickly and efficiently.  The support is available via the live chat facility between 09:00 AM and 01:00 AM every day. Outside of these times, players can reach out to the support team via email and expect to promptly receive an answer from one of the agents. Intersested in another casino? Check out our list of NZ online casinos. Licensed and regulated by Malta Gaming Authority, number: MGA/CL1/1087/2015, issued on 29th April 2015.